Star Cinema's independent film outfit, Skylight Films in cooperation with Quantum Films bring you a one-of-a-kind comedy film that will surely tickle your funny bones. "Beauty in a Bottle" stars Angeline Quinto, Assunta De Rossi, and Angelica Panganiban as the sultry characters that will not only make you laugh, but will also teach us what it feels like to accept ones beauty. Judith (Angeline Quinto), Vilma (Assunta De Rossi), and Estelle (Angelica Panganiban) are three women with different insecurities. Their lives intertwine when Vilma's advertising agency is looking for an endorser for a new beauty pill product called "Beauty in a Bottle." Little did they know, their lives will change when they finally accept what's inside the "Beauty in a Bottle." Below is the full movie trailer of "Beauty in a Bottle" as released by Star Cinema. 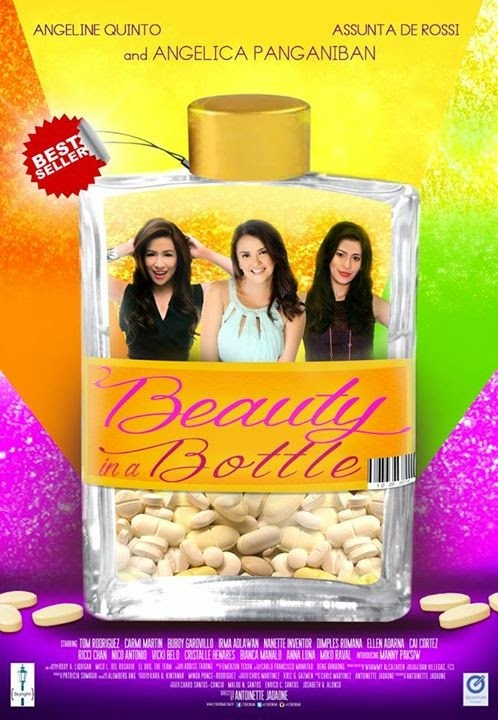 "Beauty in a Bottle" also stars Ellen Adarna, Tom Rodriguez, and a whole lot more. The movie is directed by Antoinette Jadaone. Enjoy the trailer!